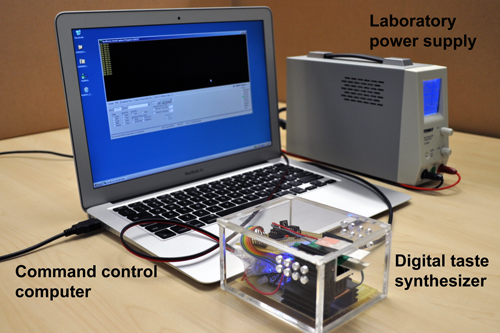 Several interactive systems can be found in the literature for simulating taste sensations, especially in the area of Human-Computer Interaction (HCI). However, these solutions mostly use an array of edible chemicals to produce different taste sensations. Using chemicals in an interactive system is unrealistic since a set of chemicals is difficult to store and manipulate. Furthermore, the chemical stimulation of taste is analogous in nature, making it impractical to use this approach for digital interactions. Therefore, it is evident that a new non-chemical approach is required to achieve digital control over the sensation of taste. 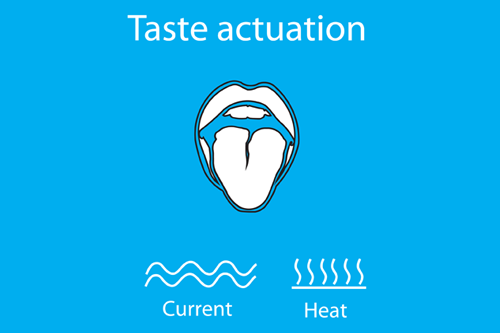 Thus, in this research, a digital method for simulating the sensation of taste is introduced by actuating the human tongue through electrical and thermal stimulation methods. 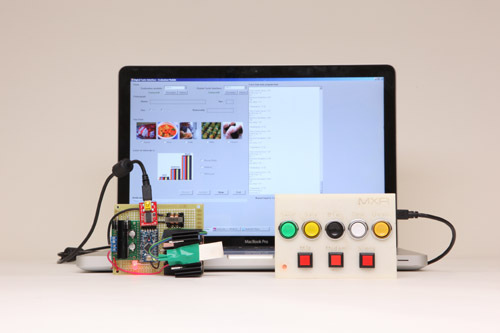 The digital taste interface, a control system, is developed to simulate the taste sensations digitally on the tongue. 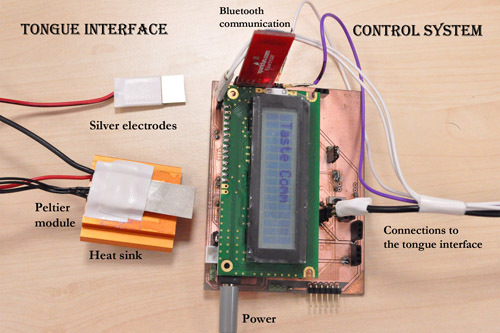 The Digital Taste Interface consists of two main modules, the control module (to formulate different electrical and thermal stimuli) and the tongue interface (which has two silver electrodes to wear on the human tongue). The effects of most persuading factors such as magnitude of current, frequency, and the change of temperature have been accounted for stimulating the tongue noninvasively. The experimental results suggested that sourness and saltiness are the main sensations that could be evoked while there are evidences of sweet and bitter sensations too. Nimesha Ranasinghe, Ryohei Nakatsu, Nii Hideaki, and Ponnampalam Gopalakrishnakone, ``Tongue Mounted Interface for Digitally Actuating the Sense of Taste,'' in Proceedings of the 16th IEEE International Symposium on Wearable Computers (ISWC), June 2012, pp. 80-87. DOI: 10.1109/ISWC.2012.16, ISSN: 1550-4816.